Leading manufacturers, suppliers and exporters of Leather Car Seat Cover. The leather car seat cov ers are made of premium grade leather supplied by most reliable leather source. Leather seat covers manufactured by us are availble in attractive designs and sizes to meet all the requirements of customers. 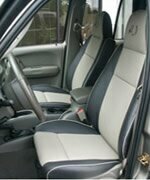 The leather seat covers are extensively used in luxury and non luxury cars. Our leather seat covers features with high comforts, stylish design and superior wear and tear resistance. We manufacture a broad spectrum of Leatherite Car Seat Covers which protct the car seat from various damages and dust. These car seat covers are available in varied designs, pattern and style to fit the requirement of the clients for various type of luxury and non luxury cars. We use high density foam padding for comfort in every Leatherite Car Seat Covers to provide maximum seating comfirts. We offer high Comfort superior quality PU Leather car Seat Cover made of premium quality raw material. We provide a wide range of designer Seat car C overs that ensures smooth and fine texture that bestows comfort. The finely processed surface finish adds on to provide an elegant looks to car seat covers. Pu leather car seat covers covers are available in various colors and patterns to cater the needs of the automotive industries.